Fiona Barton is a former long-time reporter turned fiction writer. In her first novel, she introduced readers to Kate Waters, a reporter sharing stories of real-life horrors. In her third book, Barton takes us into Kate Waters’ personal life, her life as a mom willing to do anything to save her own son. Two teenage girls take off on a trip to Thailand during their gap year while waiting for their A-Level exam results. Alex and Rosie leave with the promise to text their parents every few days and definitely call home for their exam results. When the results arrive and the girls don’t check in the parents become worried. After a week, they decide to notify the police. Kate Waters gets the story and decides its a way she can tell the story while checking in on her own son. Jake Waters left for Thailand a couple years ago and Kate hasn’t heard from him in weeks. He’s supposedly working on turtle nature preserves, but Kate has her doubts. Her mothering instinct tells her he is in trouble. As the investigation to find the missing girls continues, Kate begins to fear that her son is truly in trouble and connected to the missing girls. Barton tells the story of the missing girls through various perspectives including the missing girls’ parents, the detective on the case, Kate, and then the missing girls. The timeline goes back and forth from current when the girls have been missing to prior when the girls arrive in Thailand. Not all is as it seems on social media and calls to home and the story begins to unravel. The reader starts to wonder who is lying and who is keeping secrets and Barton throws in enough twists to keep the reader wondering what really happened to Alex and Rosie. Fiona Barton’s books are set in the UK so some of the procedures and terminology are different from what we are used to. Barton traveled to Bangkok for a weekend as part of her research and it gave her plenty of fodder for creating the nightmare setting that unfolded for Alex and Rosie. Making Kate the center of the story rather than the one telling the story was a change for Barton, but from her time as a reporter, she knows that these situations can happen to the people that tell them. Barton wrote from her own fears remembering when her son was traveling during his gap year and worried when he didn’t keep in touch. Barton opens strong with grabbing the readers attention as you know the girls are going to go missing. Then as the story progresses, there is a bit of a lull and as a reader, I wanted to hurry the pace a bit. There are a couple side stories going on with the detective and the parents of the missing girls and I felt like it pulled me away from what I wanted to read about. I was thankful for a physical copy of the book as I ended up flipping back several times while keeping the characters and timeline straight. Thankfully, each chapter starts with the character perspective the chapter is told from and the date. Readers will identify with Kate and the parents of the missing girls as their panic over what happened to their kids begins to grow. But the situations the kids find themselves in seemed a bit far-fetched and over the top to me. The idea of a gap year and sending two 18-year-old girls to Thailand alone is not part of my reality either. As a mom, it got a bit intense for me as I started to put myself in Kate’s shoes wondering what choices I would have made in Kate’s place. Barton leaves you with a bit of a moral dilemma to mull over and it’s one you will likely think about for days after finishing. Do we really know our kids and as a mother, even when our kids become adults, do we ever stop worrying? 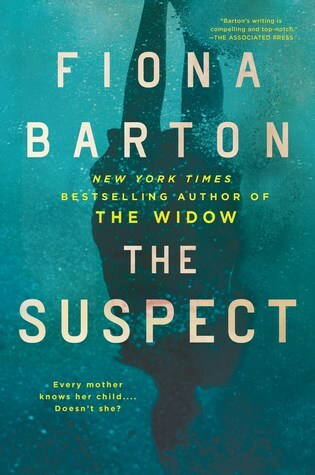 Fiona Barton is the New York Times bestselling author of THE WIDOW and THE CHILD. She has trained and worked with journalists all over the world. She was a writer and reporter for 35 years earning Reporter of the Year at the British Press Awards. Barton lives in southwest France and England. You can find out more by visiting her website, HERE. To see my review of Barton’s first book, THE WIDOW, click HERE.